Find out what Blake Shelton and Gwen Stefani find so amusing. 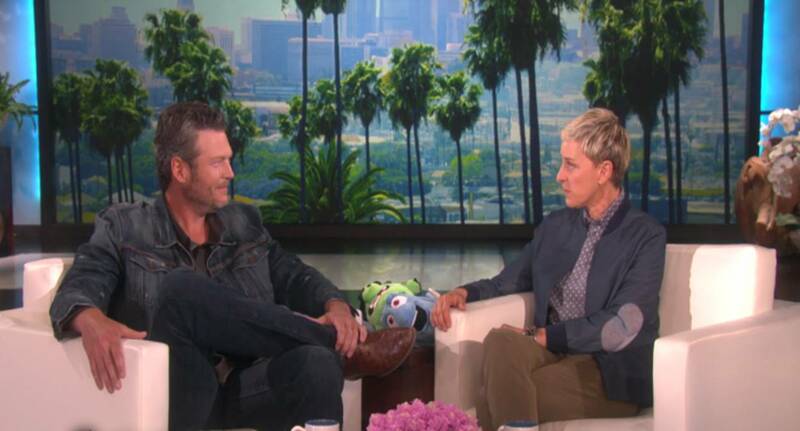 On Monday’s The Ellen DeGeneres Show, Blake Shelton, 39, discussed performing “Go Ahead and Break My Heart” with girlfriend Gwen Stefani, 46, live on The Voice and at the 2016 Billboard Music Awards on Sunday night. Ellen was quick to comment on the couple’s eye contact and body language during their time on stage together. Though the song’s lyrics are intense, Blake fessed up that he and Gwen often get a good laugh out of singing the duet. “We kind of did laugh a few times. There’s moments where it’s like, wow we’re singing this song like we’re going to break up, and we’re not breaking up right now so it seems kind of weird,” explains Shelton. Watch his interview with Ellen below! Shelton also admitted that he began writing the song before his relationship with Stefani became more serious. “And so I sent it to her, and then she wrote the other half of the song. I was like, ‘Oh, she just one upped me,'” he joked. While on the show, Blake performed his latest “She’s Got a Way with Words”— yes the tune that caused a bunch of controversy last week. Despite the lingering aftermath of two very public divorces, Blake and Gwen appear to be going strong since their debut as a couple in November 2015. We wish all parties the best.